Tethys, with Odysseus at bottom, as imaged by Cassini on February 14, 2010. Odysseus is the largest crater on Saturn's moon Tethys. It is 445 km across, more than 2/5 of the moon's diameter, and is one of the largest craters in the Solar System. It is situated in the western part of the leading hemisphere of the moon—the latitude and longitude of its center are 32.8°N and 128.9°W, respectively. It is named after the Greek hero Odysseus from Homer's the Iliad and the Odyssey. Odysseus was discovered by the Voyager 2 spacecraft on 1 September 1981 during its flyby of Saturn. 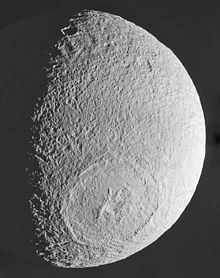 The Odysseus crater is now quite flat for its size of approximately 450 km or more precisely, its floor conforms to Tethys' spherical shape. This is most likely due to the viscous relaxation of the Tethyan icy crust over geologic time. The floor lies approximately 3 km below the mean radius, while its exterior rim is about 5 km above the mean radius—the relief of 6–9 km is not very high for such a large crater. Inside the crater the rim is composed of arcuate scarps and extends for about 100 km until the floor is reached. There are several graben radiating away from Odysseus, which are 10–20 km wide and hundreds of kilometers long. They are likely to be cracks in the crust created by the impact. The most prominent among them is called Ogygia Chasma. The central complex of Odysseus (Scheria Montes) features a central pit-like depression,:642 which is 2–4 km deep. It is surrounded by massifs elevated by 2–3 km above the crater floor, which itself is about 3 km below the average radius. ^ a b "Tethys: Odysseus". Gazetteer of Planetary Nomenclature. USGS Astrogeology Research Program. ^ Stone, E. C.; Miner, E. D. (29 January 1982). "Voyager 2 Encounter with the Saturnian System". Science. 215 (4532): 499–504. Bibcode:1982Sci...215..499S. doi:10.1126/science.215.4532.499. PMID 17771272. ^ a b c Moore, Jeffrey M.; Schenk, Paul M.; Bruesch, Lindsey S.; Asphaug, Erik; McKinnon, William B. (October 2004). "Large impact features on middle-sized icy satellites" (PDF). Icarus. 171 (2): 421–443. Bibcode:2004Icar..171..421M. doi:10.1016/j.icarus.2004.05.009. ^ "Tethys: Ogygia Chasma". Gazetteer of Planetary Nomenclature. USGS Astrogeology Research Program. ^ Hamilton, Calvin J. (19 February 1999). "Odysseus Basin on Saturn's Moon Tethys". SolarViews.com. SolarViews. Retrieved 19 December 2011. ^ a b c Jaumann, R.; Clark, R. N.; Nimmo, F.; Hendrix, A. R.; Buratti, B. J.; Denk, T.; Moore, J. M.; Schenk, P. M.; Ostro, S. J.; Srama, Ralf (2009). "Icy Satellites: Geological Evolution and Surface Processes". Saturn from Cassini-Huygens. pp. 637–681. doi:10.1007/978-1-4020-9217-6_20. ISBN 978-1-4020-9216-9. ^ "Tethys: Scheria Montes". Gazetteer of Planetary Nomenclature. USGS Astrogeology Research Program. ^ Giese, B.; Wagner, R.; Neukum, G.; Helfenstein, P.; Thomas, P. C. (2007). "Tethys: Lithospheric thickness and heat flux from flexurally supported topography at Ithaca Chasma" (PDF). Geophysical Research Letters. 34 (21): 21203. Bibcode:2007GeoRL..3421203G. doi:10.1029/2007GL031467.